We’re delighted that the first Citizen Council will start to work for all our Community members in close cooperation with our dev team soon. Thanks again to all candidates and all Citizens who participated in the election on day 41, cycle 201. The Council members had their first meeting to elect their board on day 53. With the next game update, the Council page in your CORETECHS will show the results. This also means that soon your Council will step-up their discussions, and start asking for your opinion on what to present to the Tau Station team in their regular meetings. We’re looking forward to starting this collaboration with you! The new system with 4 stations is under control of The Consortium. Cape Verde Stronghold (level 19). ‘Clone of Contention’ (level 16) on Spirit of Tianjin, part of system L 726-8. ‘Ghosts in the Machine’ (level 14) on Caen Stronghold, part of Barnard’s Star. ‘My Savior’ (level 14) on The Spirit of Tianjin, part of the L 726-8 system. ‘Shadow in the Dark’ (level 14) on Caen Stronghold, part of the Barnard’s Star system. ‘Trade Secrets’ (level 15) on Spirit of Tianjin, part of L 726-8 system. Bodyguards (Security) – Since day 46, Cycle 201, Bodyguards can be hired at the Security area. They provide vital protection against hostile attacks. 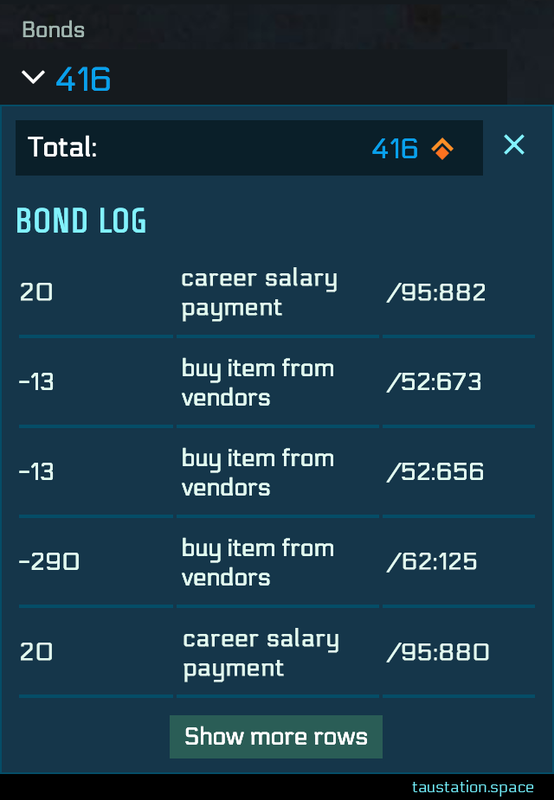 Bond Log (Information Panel) – As requested by you, a log with your recent bond balance changes is now available, similar to the credit logs. CORETECHS (Citizen Council) – A new section is in place for and about the Citizen Council who will work for the Community. Game Start (User Experience) – New adventurers will start with an additional 20 genetically-bound tier 1 rations. 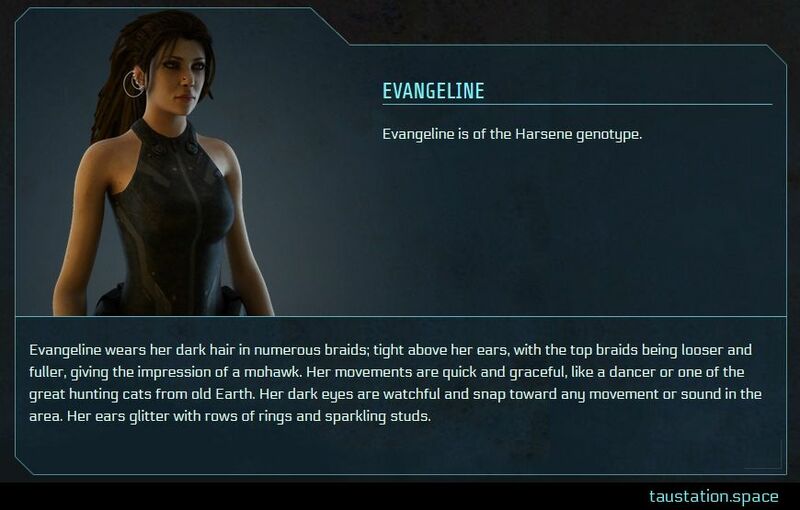 A popup will explain what to do when your stats are too low, while the guiding NPC Evangeline now has a custom avatar. University Courses (Additions) – New courses for combat stims, giving an increasing ability to take a stim in combat and still attack the opponent. Also new courses for ship hull maintenance, life support maintenance, advanced navigation, and ships engines. Areas (Headings) – The area heading has been restructured to save space. Areas (Clone Vats) – All Clone Vats have a guaranteed non-premium clone option. Areas (Embassy) – All systems apart from Sol now have a Gaule Embassy at the Jump Gate. As a side effect, the Embassies on Spirit of Botswana and Spirit of Tianjin have closed down and moved to the local Jump Gates. Areas (Jump Gates) – All Jump Gates now have an Inn, Hotel Rooms, Bar, and Lounge. Areas (Shipyard) – Orwell Station in L 726-8 got extended with a Shipyard. Campaigns (Epic Items) – 40 exclusive epic items have been added. They are only available as syndicate campaign rewards. 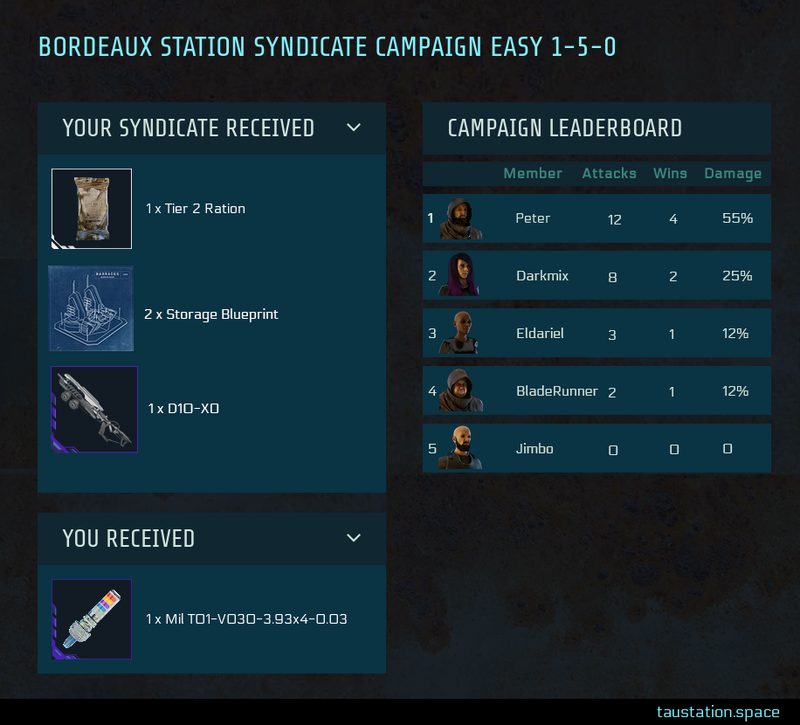 Campaigns (Result Page) – A new page shows the recent Syndicate Campaign results. Combat (Focus Fix) – Running out of focus now leads to the Sick Bay instead of the Brig. Combat (Double Click) – An issue has been resolved that occurred when accidentally double-clicking on the “Attack” button. 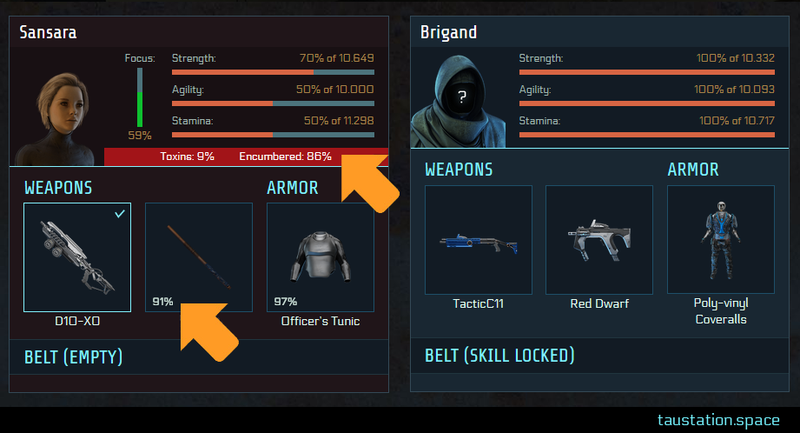 Combat UI (Improvements) – The durability of your gear is now shown in fights to better indicate if repairs are needed. The status of being encumbered (carrying too much weight) has been added to your character’s screen; next to toxins, below your stats bars. Discreet Work (Guidance) – The station name is shown in start and end steps so that you clearly know where to continue the job. Inactivity (Task Terminations) – Side Jobs, missions, and discreet work older than 15 days are now automatically terminated. An “event” notifies you about it. 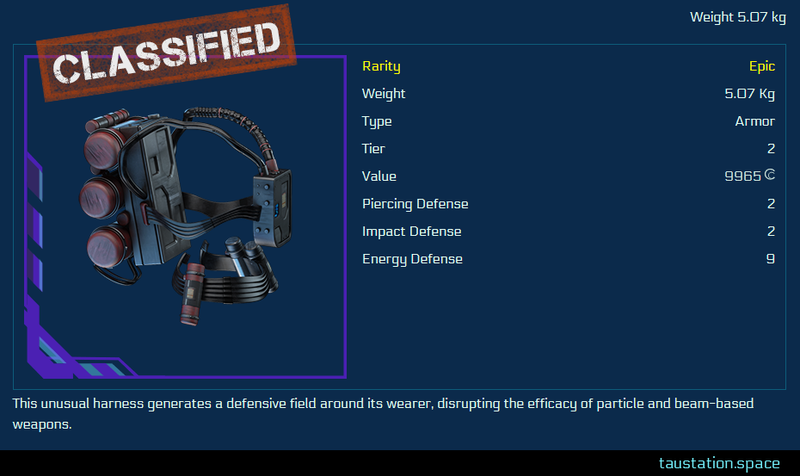 Inventory UI (Bound) – Genetically bound items are indicated with the icon in the inventory. Items (Stim Enhancements) – All stims have dedicated pictures now. They offer 50% greater benefit while military stim toxicity has been significantly reduced. Level Cap (Tiers) – The max Citizen tier will be determined by the max tier of developed stars. Right now the manual cap of tier 5 remains, later the game will auto-unlock further tiers with the implementation of stations with according (higher) tiers. Messages (Enhancements) – Withdrawing credits from the bank now generates 2 messages instead of 5. Stat increases won’t be shown anymore when they’re zero. Increases in toxin levels are now shown as a percentage. Certain messages which added items to inventory have been significantly shortened. Missions (Remove History) – The option to clear the history has been removed. Profile Page (Return Button) – The return button is back on your profile page to open the area page of your current position again. Rations (Renames) – With new, shortened names like “Tier 2 Ration” all details needed are shown at first sight, resolving the need to check the item’s details. 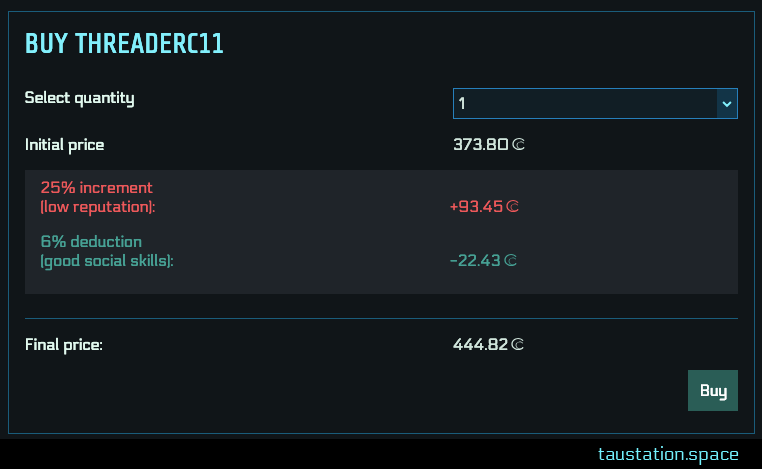 Vendors (Added) – You can now trade with NPC vendors in YZ Ceti. Vendors (Price Modifiers) – When buying from NPC Vendors, all impacts on the final price are shown with according reasons before you perform the transaction. It also reduces the feedback messages. Wallet (Display) – Fixed an issue that sometimes caused the display of credits with more than two decimal places. Text Changes (various) – As usual, we handled several typo reports and improved various texts, according to your reports (thanks!). Please check the changelogs if you want to know more details. 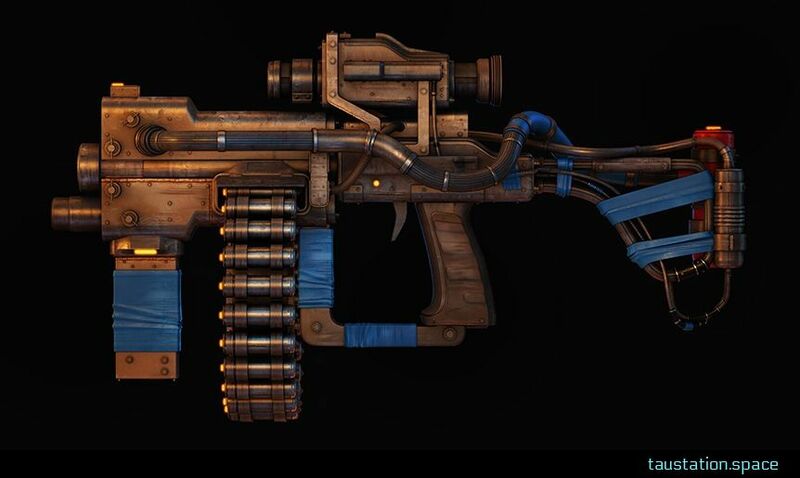 Besides the 40 brand new epic items for Syndicate Campaigns, 89 artwork updates have been added to remove the placeholder pictures on the items listed below. The numbers in brackets indicate the item’s tier. Banded Kuyak (2), Battered Breastplate (1), Chitinous Cuirass (2), Composite DŌ (2), Corroded Combat Vest (1), Dented Dual Layer Vest (1), Enhanced Combat Vest (1), Light Kinetic Vest (2), Light Plate Armor (1), Misshapen Combat Vest (1), Padded Anti-Energy Vest (1), Patchwork Bomber (1), Putrid Plate Mail (1), Reinforced Vest (1), Rusted Cuirass (1), Scavenger Plate (1), Scorched Electricians Suit (1), Scratchy Tunic (1), Spiked Leather Jacket (2), Tarnished Combat Armor (1), Thick Leather Armor (2), Thick Plate Armor (2), Worn Composite Armor (2). Two Bond Certificate, Five Bond Certificate, Ten Bond Certificate, Twenty Bond Certificate, Thirty Bond Certificate, Forty Bond Certificate. Alpine 1NK (2), Angry Mouse (3), BasicC99 (1), BuzzC7 (2), DisturbanceC11 (2), Dur-Zip-Zap (3), Ear Piercer (1), ENT-SMG (2), EntrepreneurC481 (1), First Mate’s Input (2), G-007E (1), G-009E (1), G-RM (2), G-RPS4 (2), Handgun Reclaim (3), Jolttooth (2), OfficerC2 (1), Old SMG (2), Plankwalker (2), Pulse Rifle (1), Real Red Refusé (2), RepeaterC2 (2), Slug Rifle (1), Standard Energy Frame (1), TalentC18 (1), Tenderizer (2), Thowan-89 (3), Trusty Field Hand (2), Vera (1). Bagh Naka (2), Basic Tactical Blade (1), Battery-Rigged Short Plank (1), Breakfast Knife (2), Carbon Mace (1), Charged Tonfa (2), Consortium Jian (2), Corvo (3), Cudgel (2), Juggler’s Sticks (2), Ka-Bar (1), Kukri (1), Meat Knife (2), Nail Cudgel (1), Old Copper Pipe (2), Old Sword (2), One Life Kaiken (2), Pipe with Grip (1), Pipe (1), Pole-Pike (1), Primitive Tonfa (1), Rusted Butterfly Knife (1), Paris Sabre (2), Platinum Cestus (2), Sharpened Ice Club (2), Strange Rod (1), Stun Stick (1), Surpression (1), Traveler’s Maul (2), Truncheon (2), Zeni Espantoon (2). 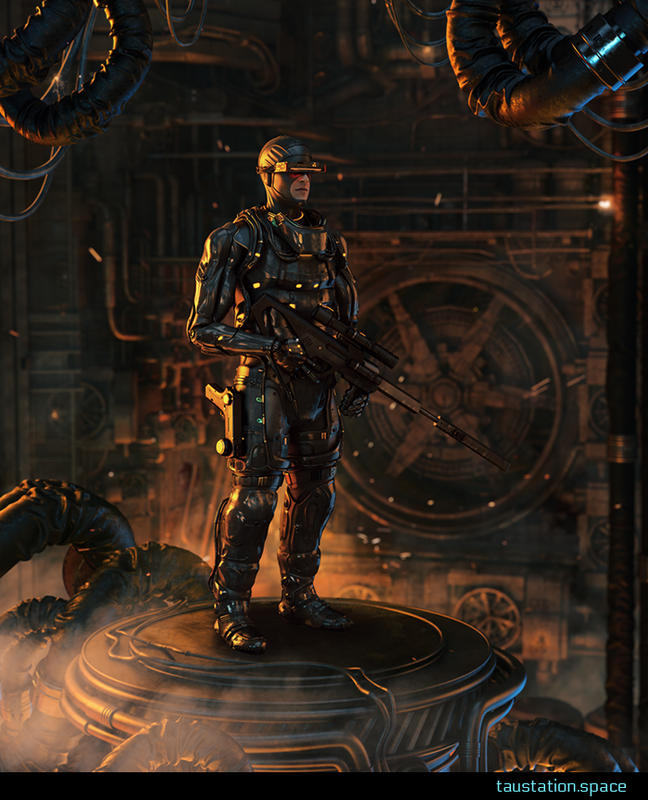 3D artwork of The Warden bodyguard. 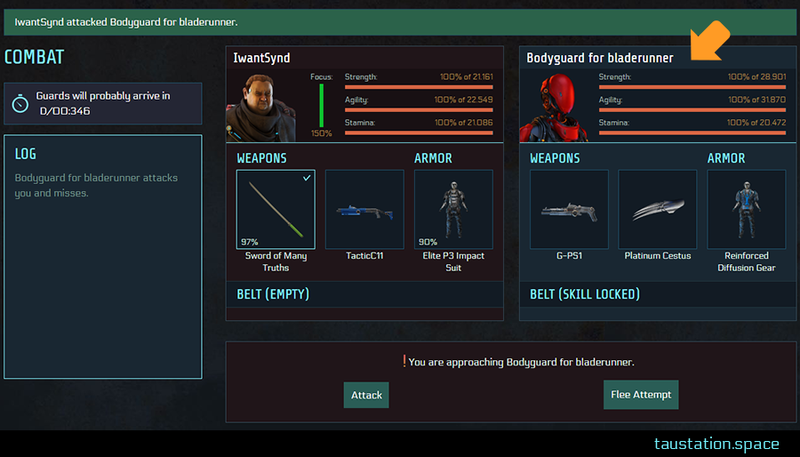 Encumbrance and gear condition are displayed in combat now. 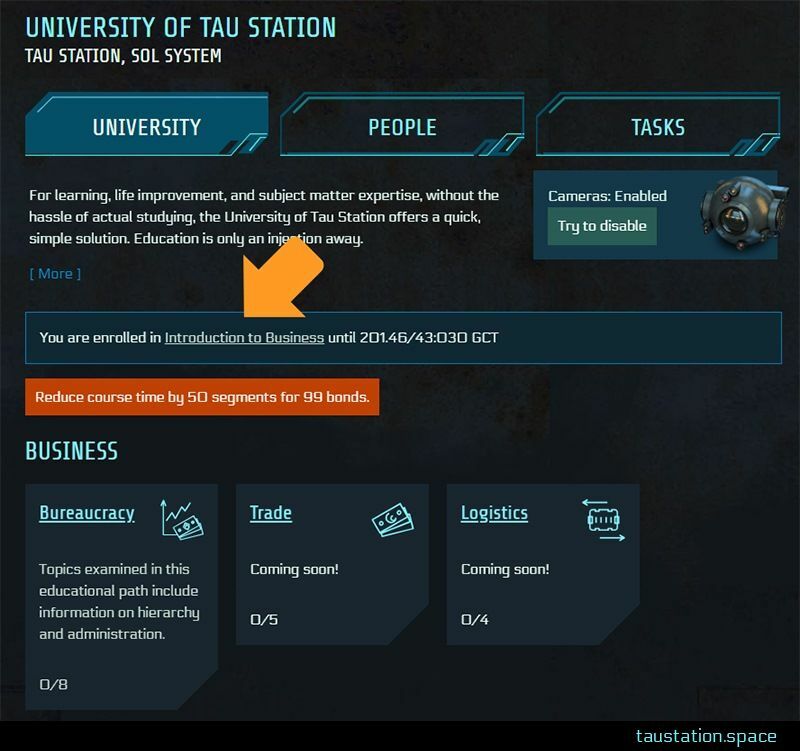 The status reports contain major aspects of the recent work done on Tau Station. As we’ve been providing changelogs for every game update, you can find way more details, including all smaller changes, in these posts. 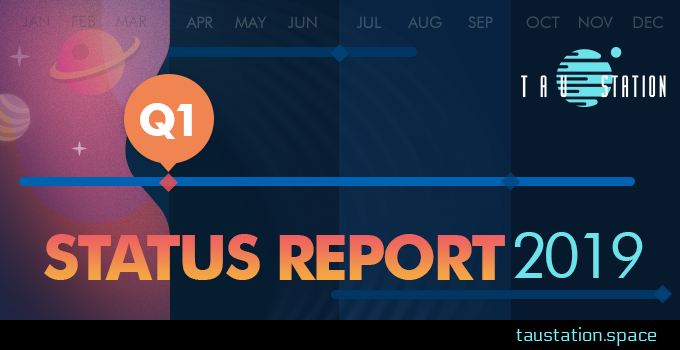 Links to all updates/changelogs that happened in the quarter of this status report are listed above.